Pedaling the road: Can you feel a color? As the season is over the regular 'best of the year'-posts show up. These are actually one of my favourite posts, they represent all the good memories throughout the year. The chance to review the best happenings of a whole season fills me with joy and brings my level of anticipation for next year even higher. And it has been quite a year. This sport of ours takes leaps in several ways, the technological and social. At the same time tiny baby steps on other frontiers, like governance, rules and point system to mention a few. There's been some interesting discussions regarding this matter but that is a post on its own. I salute the riders, not only the winners but the performance or achievement of the others too. Endurance, both the strictly physical element as well as mere psychological barriers, have fascinated me over the years, and I believe that's partly the reason I find cycling so fascinating in the first place. This years tour and giro was all about suffering. The giro was much harder than the tour, but a rider can suffer like a dog and perform higher than expected, no matter how steep the mountains. Sprinters don't have easy days during a GT, as Mark Cavendish says in Michael Barry's Le Métier. Riders who give their all create history and ensure their place in fans' hearts. I have heard of fans and others who actually claims an heroic effort gave them a brand new impression of a rider. Call it shallow and superficial if you must, but I consider this a very human thing to do. So, in this post I want to focus on those who outperform the expectations. Especially those with a jersey. What does it mean to wear a pink or a yellow jersey? Why do some rise to the occasion while other don't? There is an expression that goes something like this: You don't rise to the occasion in combat, you'll sink down to the level of training. "Am I still in yellow?" As earlier mentioned, Hushovd had seven days in the yellow jersey during the tour. Earlier tours, when they started with an easy seven kilometres prologue, sprinters could compete for yellow the first four-five days, but this was different. "I know I'm in shape, perhaps the best shape of my life. Knowing that makes one dig very deep inside myself and get everything out. The jersey is a motivation in itself." "I cannot be disappointed when I loose the yellow jersey because I have given my all each day to defend it." The great Eddy Merckx was driven by his own goals, at least according to this article. "The biggest pressure to perform came from within me". "Quiet, internal motivation", are some of the words used to describe the great champion. 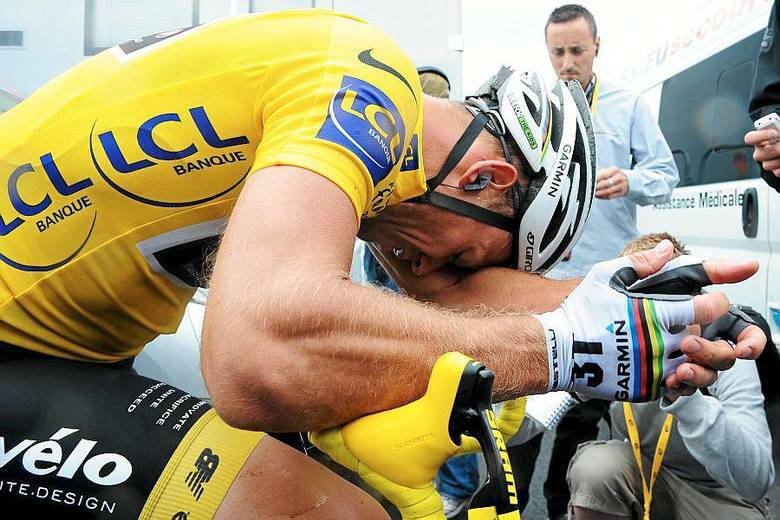 At this year's Tour de France, almost everyone expected Thomas Voeckler to loose the yellow jersey afer a day or two. Europcar's Jean-René Bernaudeau said this to velonews after the third day in the Pyrenees: "The team has really surprised me with how well it's defending the yellow jersey. It gives us wings." Even though Voeckler is known for his attacking style of cycling, at least when the tv-cameras are on, he did something incredible this summer. Arguably, some said this was solely because the big favourites focused on each other. And who can forget Johnny Hoogerland standing on the podium in his KOM-jersey, after being thrown into a barbed wire fence following a collision with the TV-car? Truly one admirable action, that speaks for itself. What make athletes live the life they do, and choose as they do? Motivation is perhaps the most researched field in psychology. The general curiosity concerning the elements that can make us shape our future, is it possible to influence our ability to make choices? To explain behaviour is always easy in retrospect, but it is priceless to be able to see history in the making. Some prefer dividing motivation in two main characteristics; intrinsic and extrinsic. Science and research often point to several different types or theories of motivations, based on instinct, incentive, drive-reduction, psychoanalytic theory, broad theories as well as different cognitive theories. The common denominator, however, seem to be emotions, which is very interesting. To simplify the matter, we might say we all tend to maximise pleasure while we at the same time try to minimise pain. Sadly, the different theories are too many to investigate further here, but feel free to reflect on what drives the different riders when they perform, I'm sure there are differences. The tour was splendid, especially for us Norwegians. Riders and journos have for many years described the vikinghelmets during the tour. This year was exceptional, with EBH and Hushovd taking four stages and Hushovd made seven days in the yellow jersey. I noticed that many tweeted their surprise to how determined EBH seemed during stage 17 to Pinerolo, it truly was a beastly performance. Those who know EBH knew he would come up with something after being outsprinted by Hushovd the day before. He called his father the same evening, sounding very determined claiming that "tomorrow, I'll win." After trying to get into every break that day, and being hunted down every time, finally the break established itself and the rest is history. Some people just have this ability. Debate it, research it,and call it whatever you like. I just love to watch it take place. Just came across your blog. Thanks, I'm very much enjoying it. How about telling us also some things about cycling, cycle touring in Norway? Your beautiful country is high on my list, if I ever get past France when I travel! Hi Suze; yes I will write some posts about Norway as a cycling destination. There are some fantastic climbs here, and riding on rolling hills close to the fjords is priceless. It's on my to-do list during late fall.